Hello-Hello, Happy Hanukkah to our friends who are celebrating, and Merry Almost-Christmas! It’s wonderful to be back blogging. Between business obligations and other commitments it has been more than a little crazy here at The Prepatorium, a big “Thank You” to The Consort for his kind contribution Tuesday. ….the collection centers on 20 different blush colors in the form of cameos. Also in the line are liquid foundation and lip color. The collection will debut in Japan early next year, prior to a European and US introduction. It really isn’t that big a departure from the brand’s existing lines, they already offer the Ladurée Beauty collection: candles, bath salts and other goodies. We always enjoy even the tiniest taste of the company’s macarons, and the packaging is always exquisite – how pretty is the new Houndstooth collection?! Our other item also comes via WWD (subscription req’d. ), and it deals with a familiar character. You see, every week the publication selects a Man of the Week and dissects his style; to be honest, the critiques aren’t always flattering. But today’s feature looks at someone who is a household name and applauds his timeless look, here is a snippet from Man of the Week: Santa Claus. He’s ahead of his time: Beards are the “It” trend in men’s grooming. He rocks the red velvet leisure suit. Faux fur trim is the must-have of the season, but Santa has known it all along. White gloves are a little debutante, but necessary to keep his fingers clean after eating all those cookies. It almost sounds as if Mr. Claus has some prep in his background: timeless style, practical apparel and accessories, a refusal to be dictated to by the fashion crowd….hmmm. You know what that sounds like to me…! We leave you with today’s Pretty in Pink, the American Retro Estate Wagon. We found this one at Barneys in the Girls department, clearly a classic. #9) Claremont McKenna: The description of this school explains ” The CEO of Abercrombie, Michael S. Jeffries, graduated from the school in 1966.” Our thought? Clearly Mr. Jeffries has a short memory, nothing Abercrombie sells could even remotely be referred to as preppy. There are a few more surprises on the list this year (including a university picked as the “Preppiest College” in a Social Primer list), we recommend a visit to the Huffington Post to read the story in its entirety. As you might imagine, the story has generated quite a few comments. Many wonder about schools not on the list (i’m not sure *any* of the 2010 schools made the list), asking about Elon, Middlebury, Colgate, Vassar, etc., others talk about what is/isn’t preppy and unsurprisingly, there are a few comments about Abercrombie. Also today, another update on the new Lilly Pulitzer for Lee Jofa fabric collection. High Street Market has a lovely post about the collection, showcasing some of the just-released patterns. The Lee Jofa site now has images online, including some of the trims that go with the collection, we’ll call these today’s Pretty in Pink. Although The Prepatorium isn’t currently slated for any kind of interior design redo, we do enjoy looking at all of the pictures. Lee Jofa has a scaled down version of the catalog available for online viewing as well. On that vibrant note, we say goodbye until next time! Dressing for Dinner with Tory, Vuitton’s Creatures, Has Kate Designed her own Dress?!? Hello-Hello, welcome to a new week. We begin with a little party-hopping, Tory Burch was honored at last week’s “Dinner with a Designer” gala, put on by the CFDA (Council of Fashion Designers of America). Below, Haillee Steinfeld (l) and Eva Amurri (r), both wearing Tory Burch. Other stars on hand, Teresa Palmer, Michelle Monaghan and Kristin Davis, all three ladies are also dressed in pieces by the designer. We’re guessing singer Eliza Doolittle may be one of those underdressed individuals being referenced in the quote above. It is difficult to grasp why anyone would arrive at a party attired this way. A few very brief updates on the Kate Middleton wedding dress front, the rumors and speculation are now flying at a fast and furious clip. Over the weekend Yvonne Yorke wrote “exclusively!” in a HuffPo post that the designer is Sophie Cranston of Libélula, some readers may recognize the Dulwich coat from that label as worn earlier this year by Miss Middleton. One peril of suddenly achieving notoriety on a global scale, the traffic can crash your website. One other note, this one on a footwear line favored by Kate Middleton that we also happen to like, Women’s Wear Daily reports that LK Bennett is entering the US market. The line will be available this fall at Bloomingdale’s and other upscale shops, as well as two LK Bennett boutiques. “NBC Universal has cut a number of pretaped segments from its “aggressive and comprehensive coverage” of the royal wedding because insiders fear Prince William and Kate Middleton are “too boring,” according to sources. According to the paper NBC denies they are cutting back on coverage. We have good news for stateside readers interested in the mugs, they are now available internationally. Below, some of the images accompanying the promotional information (we don’t recognize *any* of the three styles shown). We leave you with a few amazing creations from Louis Vuitton. Via "If Its Hip Its Here"
A very different use for the usual offerings from the luxury leather goods company. Hello-Hello, and Happy-Happy Friday to everyone! Yes, we do think today merits two Happies, it has been that kind of week. We remain mystified at our ongoing delusion that tomorrow shall possess a marked diminution in stress and activity, it is that point in the season where allofthedaysruntogether. But it is loads of fun and we are grateful to be doing what we love, if we were still doing television it’s likely we would currently be engaged in weather coverage (you know what we mean, portraying a little snow as apocalyptic, the forecast requiring DEFCON 4 status, that sort of thing) at this point. As our headline notes, Preppy is Back! Again! To be honest, we have nary a clue if this is Version 29 (as cited in the post title) or 42 or 18; we haven’t kept track in our 774 posts (eek!) of all the times we have reported such declarations and pronouncements. This time CNBC is the media outlet sharing the ‘news’. To be fair, the cable news channel’s story approaches the topic from a business perspective. “Straight Up or With a Twist, Preppy’s Back” looks at retailers benefiting from a resurgence of the styles some associate with the preppy aesthetic. Ahem. A shift? Nay, nay sayeth preps everywhere. The story looks at several versions of “prep” previously discussed in this space, notably “urban prep,” “hipster prep,” along with other styles not applicable to our personal taste. The ‘shift’ described in the article is attributed to consumers growing tired of denim. The story lists LL Bean, Brooks Brothers, Vineyard Vines and Lilly Pulitzer as brands benefiting from the increased focus on classic styles. True Prep author Lisa Birnbach is quoted in the story; we couldn’t agree with her more about a brand currently occupying a place on the AntiPrep Wall of Shame. Amen to that sentiment. As always, we smile at the return of something that never left, but in this case we can see where evolving styles have impacted sales and profits at certain retailers, prompting CNBC’s coverage. Click here to read the story in its entirety. The Trib (Chicago) also had a preppish piece, asking “Who is the North Shore Prep?” Here are a few identifying traits from the story. Nashville preps will be happy to know Vineyard Vines will add a second store in that city, the new one is slated to open in February. J. McLaughlin celebrates its new Westport (CT) store this Sunday. Dior’s flagship store on 57th Street reopened this week after a major remodeling, a number of celebrations marked the occasion. On hand at the store, actress Amy Adams and Gossip Girl’s Leighton Meester. Our favorite look had to be Karolina Kurkova’s (L), while Natalie Portman was stunning. As many readers know, Miss Portman’s “Black Swan” open across the US tonight, that one is near the top of our list. Tomorrow we have a special treat, a visit from the Queen Bee herself. The Bee is going to be popping in now and again to share some of her thoughts and insights on April’s royal wedding, and tomorrow is the first of her posts. We are very excited the inimitable Bee is going to be visiting! On that sunny note, may everyone revel in a stellar weekend filled with cheer and charity. Welcome to another wacky day here at the Prepatorium, it is one-topic Tuesday, we have a look at Brooks Brothers for spring, along with some changes for this season. Below, some of next spring’s nautically influenced styles. Like many other firms, Brooks does not do a runway presentation during Fashion Week, instead opting for a static presentation. Readers may recall Brooks’ recent ventures into new venues, including collaborative partnerships with outside entities, like Levi’s (more in this post), and the Social Primer Bow Tie collection (click here for more on this endeavor), steps into new venues with items like the Mad Men suit (more here), as well as continued expansion of the Black Fleece label, with the opening of standalone Black Fleece stores on both coasts. Women’s Wear Daily reports that online Black Fleece operations will soon be separated from the Brooks Brothers website; the launch of BlackFleece.com is expected some time in October. More from the spring 2011 collection, we believe the following looks are Black Fleece styles by Thom Browne. A few Black Fleece items we thought looked lovely, in the photo on the left we adore the dress with its darling bow at the neckline, and the blouse/skirt combination in the photo on the right (we’re presuming the top isn’t as sheer as it looks). The black and tan group is particularly striking, although it is unlikely the men’s styles will make an appearance here in the Corner Condo; a little ‘too-too’ for The Consort. And one more group from what we believe are Black Fleece pieces. Some accessories that are very Thom Browne, his signature stripes lead us in that direction. We move on to another specialty line, the recently announced collection to be marketed under the ‘St. Andrews Links Exclusively for Brooks Brothers’ label. Brooks announced the partnership back in March, this is the first opportunity we have had to see any of the pieces from the new group. The long-term St. Andrews agreement names Brooks Brothers as a worldwide partner, and looking at the rather sparse offerings in the Country Club offerings online, we have put in an inquiry to see if the St. Andrews merchandise will replace the Country Club collection. Back to spring styles in regular (non golf or Black Fleece) merchandise; we like the primary colors. Not to mention the madras…. While not fond of the logoed sweatshirt, we do like the apparel in the next two images, as well as the code flags suitcase. 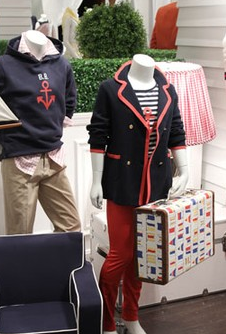 The suitcase bears a striking resemblance to one of our Preppy Pillows, the Regatta model. Classic Brooks Brothers styling was evident throughout the presentation. As well as updated style for the new children’s Fleece line. This may be the most promising seasonal preview we recall seeing for quite some time. Jean Palmierei’s story in WWD also noted the addition of three new Black Fleece fragrances, slated for a November launch. We are back tomorrow, with more grins and giggles!